View an interactive radon map here. To learn more about radon, how to measure it and its effects please click on the following links. The maps at left are a snapshot of the EPA's measurement of likely radon concentration levels. 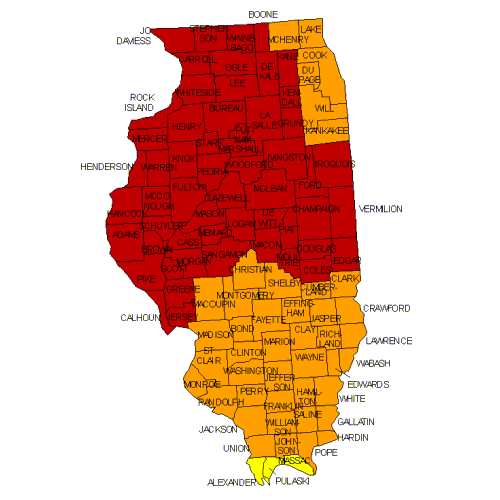 Red counties indicate predicted average indoor radon screening levels over 4 pCi/L, the highest ranking given by the EPA. To view an interactive map of the concentration levels found in the United States, and learn more about radon, please click to visit the EPA's site. Radon measurement is available as part of a home inspection, or as a service on its own. Radon measurement with an inspection is $125. Radon measurement by its self (no home inspection) is $150. The 10% discount mentioned on the Home Inspections page does not apply to radon measurement.